So I was standing there, chopping veggies to make chopped salad (see previous example here), and wondering what to do with all that reserved tomato juice I had saved from the salad plus the lomi lomi salmon. 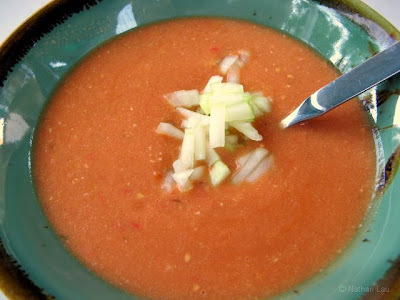 Suddenly, a word popped into my noggin: Gazpacho! Oooh, I hadn't had *that* in a while. It's a pretty simple recipe, but one ingredient that was new to me was smoked Spanish paprika. And what do you know, we actually happened to have a package of that, that we purchased at the Penzey's Spices store in Houston! This was one of the best gazpachos I've made. It's not too spicy, as I held back on the pepper and the raw garlic. That smoked Spanish paprika made the dish, I thought. Our friend raved about it, saying it was better than the one he had tasted in Italy that got him hooked on gazpacho in the first place. This recipe is a keeper. I'm gonna make it again soon (of course, using only Annie's homegrown tomatoes)! I think i need to give Gazpacho another chance. He was so good to me about 8 years ago...then a bad restaurant happened and I haven't had G since.